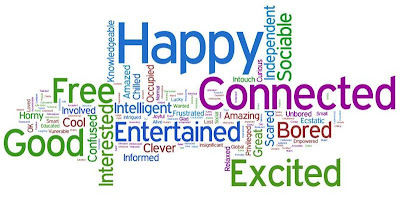 Nesta Connect has made this Wordle to describe the key headlines from a survey from Mediasnackers - The Web Makes Me Feel. It explores how young people in the UK feel about the web and also the reasons behind the emotions. You can browse all 500 odd responses at the Mediasnakers site here. I twittered this story yesterday, and had some really interesting connections. See Lynda Kelly at the Australian Museum, here, and the pick up from Karen Melhuish at TKI English Online. Sounds like an Australasian version would be a useful piece of research. Small world. DK, one of the founders of Mediasnakers is coming down to NZ in October to the Core Ed, uLearn conference in October. Details on this here.